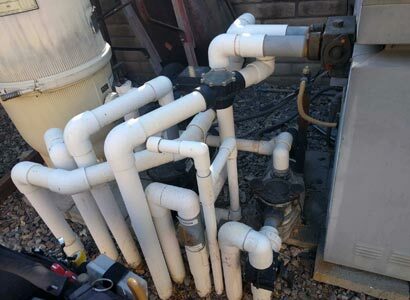 As with all pool pumps, over time they will start to have issues. Leaking pool pumps, and noisy pool pumps are just a couple of reasons. This Encinitas pool pump was encountering both of those problems. This older single speed Sta-Rite pool pump was on it’s way out. Because it was a single speed pump and the customer was looking for an energy efficient pool pump upgrade, we installed a Pentair variable speed pump. Pentair energy efficient, variable speed, smart pumps are a great option when upgrading your pool pump in Encinitas or anywhere else you may benefit from the energy savings. These Pentair pumps provide you with the ability to operate the pool pump with varying speeds. This is what makes it energy efficient. The saving energy part is based on the pool pump running at lower speeds when higher speeds are not needed. That is most common when simply circulating the pool water for sanitization. When just circulating, you are able to run the pump at a much lower speed than the typical single speed pumps. By doing this, you can lower the rpm’s to operate at 1/2 to 3/4 less operating expense. That is a big jump in efficiency. This variable speed pool pump upgrade also allows you to maximize to output when needed such as when using the hot tub. This is especially true if you do not have a spa booster or jet pump to help. By increasing the rpm’s when using the spa or hot tub, you can get the best jetting effect possible to enhance the enjoyment and therapy needs. Regardless if you have pool automation, these pumps work perfectly for increasing the energy efficiency and cost savings for running the swimming pool and spa. We typically recommend the Pentair variable speed pool pumps as they perform really well in the field by holding up to age and the elements. Pentair pumps work with all types of pool automation or pool controllers so you do not need to stick with the same pump as your automation. We will install any pool pump though we recommend Pentair. A few things to keep in mind when upgrading your swimming pool pump. 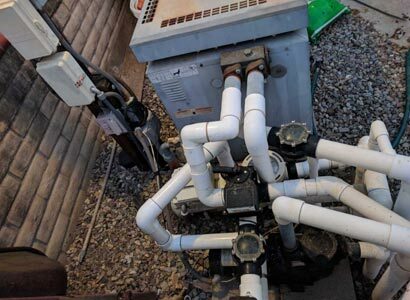 First is that if you have solar and it is warm enough to operate, the pump will ramp up and lose some efficiency to allow for enough water to pass through the solar panels. Also, a good reason why it is important to have a professional licensed contractor install the pool pump. Programming each of the pumps speeds are important to maximize the overall efficiency. 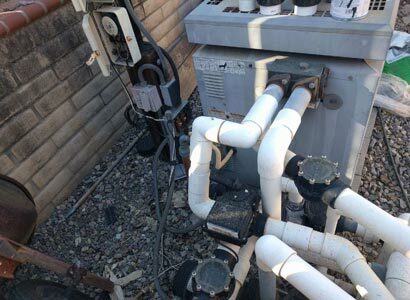 Often we find variable speed pool pumps left in a default program and not benefiting the pool owner. Older versions of these variable speed pool pumps were also slightly more difficult to use. This is because the pump controller was fixed to the back of the pump motor. Now the newer versions are much better. If you do not have pool automation installed, you will need to operate the pump from its own controller. This is now much easier as they have provided a remote installation capability allowing us to make it easy for homeowners to access. We can mount it to a wall or a fence, anywhere it is more convenient. Live In Encinitas And Need To Upgrade Your Pool Pump? If you live in Encinitas or any other areas of San Diego County, we can help. Providing professional pool pump upgrades by a licensed pool contractor that specializes in pool pump upgrades and pool pump repairs. If you have any questions about your existing pool pump or upgrading to a new pool pump we are happy to answer your questions. 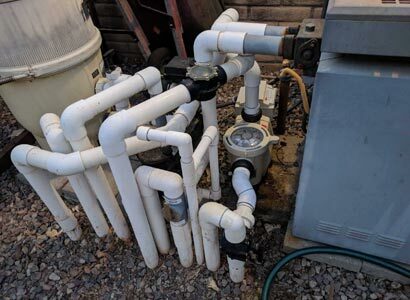 If you are ready for a variable speed pool pump upgrade or just need a single speed pump replaced for a water feature or hot tub, get in touch with us to schedule a per-site or estimate for the work needed.